Educational brochure defining AIS and discussing Activase® treatment. 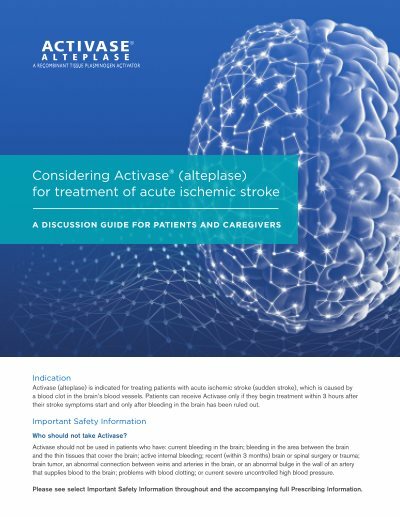 Activase (alteplase) is indicated for the treatment of acute ischemic stroke. Exclude intracranial hemorrhage as the primary cause of stroke signs and symptoms prior to initiation of treatment. Initiate treatment as soon as possible but within 3 hours after symptom onset. Activase can cause significant, sometimes fatal internal or external bleeding. Avoid intramuscular injections and trauma to the patient. Perform venipunctures carefully and only as required. Fatal cases of hemorrhage associated with traumatic intubation in patients administered Activase have been reported. Heparin, aspirin, or Activase may cause bleeding complications; therefore, carefully monitor for bleeding. If serious bleeding occurs, terminate the Activase infusion, and treat properly. Hypersensitivity, including urticarial / anaphylactic reactions have been reported. Rare fatal outcome for hypersensitivity was reported. Angioedema has been observed during and up to 2 hours after Activase infusion in patients treated for acute ischemic stroke and acute myocardial infarction. In many cases, patients received concomitant angiotensin converting enzyme inhibitors. Monitor patients during and for several hours after infusion for hypersensitivity. If signs of hypersensitivity occur, e.g. anaphylactoid reaction or angioedema develops, discontinue Activase and promptly institute appropriate therapy (e.g., antihistamines, intravenous corticosteroids, epinephrine). Cholesterol embolism, sometimes fatal, has been reported rarely in patients treated with thrombolytic agents. Coagulation tests and/or measures of fibrinolytic activity may be unreliable during Activase therapy.